On this edition of Press Conference USA, host Carol Castiel and VOA TV producer Phillip Alexiou, talk with Steven Wallace, founder and CEO of the Omanhene Cocoa Bean Company — the first company to sustain exports of premium chocolate manufactured entirely in Ghana. Steven recounts the origins and challenges of this daunting endeavor in his new book Obroni and the Chocolate Factory: An Unlikely Story of Globalization and Ghana’s First Gourmet Chocolate Bar. This entry was posted in Newsroom, Radio and tagged Obroni, Radio, Steve Wallace on March 19, 2018 by Jon Wallace. Listen to Mitch Teich’s interview of Steven Wallace on WUWM’s Lake Effect. This entry was posted in Newsroom, Radio and tagged Ghana, Obroni, Omanhene Stories, Press, Radio, Steve Wallace on November 20, 2017 by Jon Wallace. 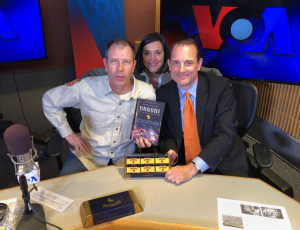 November 20th, 2017 – Listen to Paul Miller‘s radio interview Steve Wallace regarding his new book, Obroni and the Chocolate Factory. This entry was posted in Newsroom, Radio, Uncategorized and tagged Ghana, Obroni, Omanhene Stories, Press, Radio, Steve Wallace on November 20, 2017 by Jon Wallace. Omanhene has been wonderful to work with as a vendor - an outstanding product that we've been proud to serve to our customers and great service from real people that care.